I don’t know when I developed such huge fascination with tiny critters like ants and crabs, but here we are so I’m just going to go with it. We’ve spent a lot of time on beaches lately and we keep coming across these little piles of sand on the part of the beach that’s flat and wet after the tide goes out. 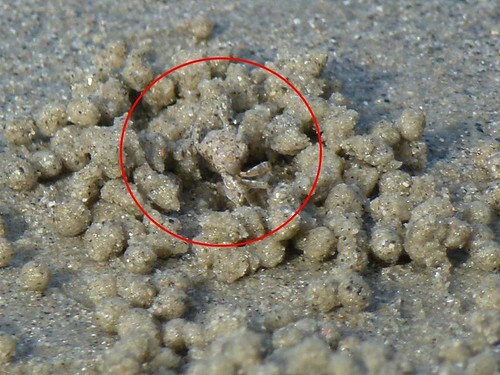 We didn’t think much of it at first, but after a while we realized that the pile was actually a bunch of little sand balls that were set up by these crabs. As they create tunnels (or whatever it is they are creating down there) they roll out the sand in little balls and scatter it around the entrance to their domain. 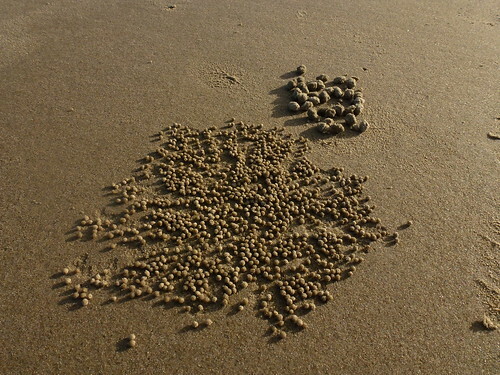 It’s all very organized, and you can tell the size of the crab by how big the sand balls it produces are. 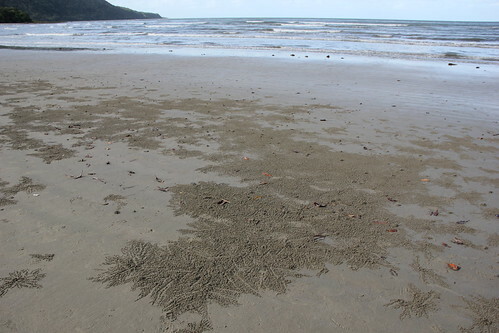 We were at Cape Tribulation, in the northeastern part of Australia, and the beaches were totally packed with these critters. They must have to do this every single time the tide goes out as I imagine all their work collapses at high tide. All the non-smooth sand is really made up of their handiwork. You can even see the little paths they kept clear as they rolled everything out. Industrious little buggers. I really think that they smaller the creature, the more adorable it is! I can remember seeing these – I think they might be Soldier Crabs. Fantastic, aren’t they? So fantastic, we could not stop watching them!